It looks like my October monthly high is going to be right around 72F, with a low in the mid-40s. Much closer to normal than last year, which was 75.9F / 50.2F. 1931-2016 mean high is 71.3F here. My Fall outlook (Aug 15) had 69.9F, assuming a Neutral, I upped it to 71.0F in the Winter outlook (Oct 12) once the La Nina started to develop. July/Oct highs were both close to 4F colder than last year, with August highs warmer than last year but still colder than against 1931-2016. Suspect November will be pretty warm here, but I'd like to be wrong. Will be interesting seeing what the Canadian has for November & Dec-Feb in a few days. So far, the "persistence of heat" in La Nina thing seems to be working - we tend to have near normal heat in the cold season here in La Nina if the number of days at/over 87F from Apr-Oct is much higher than usual. Years with excessive persistence of heat are frequently 2-4F colder in Oct-May than years with less persistent heat. November should be a good test, the "persistence of heat" thing makes the biggest difference in November. I went with 59F for November, but I'd love to be wrong. Been assuming the difference between the mean of the two subsets, subtracted out from 2016-17 observed highs, would be a decent indicator for temperatures this year. DT put his winter outlook out on Facebook, looks close to my national map if the QBO behaves a certain way according to him. Larry Cosgrove has an interesting outlook out. Weatherbell has their final outlook out too (free). This is an interesting double ridge in the North Pacific, which is teleconnected to the trough in North America and colder-than-average air mass. Gee, Raindance, you have to get a job with a climate or energy forecasting firm. Your personal efforts of cataloging indices and seasonal weather observations must have taken a long time. Don't get a job with the CPC-- they always do things with their formula for (non)success in the long range (2-12 months in the future). They wouldn't like innovative analog methods like yours. I also think the CPC sort of "bets" on global warming-- they forecast more areas of above normal and equal chances than below normal. That thinking should have increased their skill score in quite a number of months, but that sort of thinking didn't help in the few months leading up to 2013-2014 Winter. The initial set up took a long time, but I'm lazy now - I just automate things and make my computer do it. The new Canadian seems to understand what I posted above, Nino 1.2 came in colder than it had it for October, and sure enough it trended the Gulf of Alaska colder. Today, we had a high of 43, but the NWS predicted high was 57. The cool polar air never mixed out the inversion, and we never lost the low cloud deck. If you look at years with a very cold Nino 1.2 in October (barring NOAA bs it should be around -1.4C) but a positive PDO in Mar-Aug it's frigid in February nationally. There are only four winters since 1950 with a >0 PDO in March-August, followed by a -1.0C to -1.8C Nino 1.2 in October, excluding 2017 of course: 1978, 1988, 2005, 2007. 4/66 is pretty rare. The QBO blend, since everyone seems to love that these days, looks negative too. 1954/2010 just miss the positive PDO cut but don't change the outcome too much - 2010 and 1978 were somewhat positive QBO years. A couple of these years were high solar, which I don't like - 1988, 1978. One thing that scares me a bit is October was the exact opposite of these four years - hot in the West, near normal in the East. That may be the solar aspect of it since the West seems to be colder and/or wetter in low solar years while the East is either frigid and wet or warm and dry. The two low solar/warm AMO years, 2005 & 2007, with a >0 PDO in Mar-Aug, but a frigid Nino 1.2 looked more like Oct 2017, with cold in the NW (although not inland enough). The Modoki values are also all over the place for each of the four winters, and "Box 3" in the Modoki formula is fairly strongly correlated to temps in the West. This isn't my winter forecast, because I don't like the Modoki / AMO / Solar aspect of the 1978/1988/2005/2007 blend, but its interesting to see a blend of more modern years produce something similar to what I had from 1932/1943/1944/1996/2005/2007/2008/2012. Over the past week, western Montana and Wyoming have done well on precip (mostly snow) and they should do well again. Cold air now has seems to be in place across Montana for several days. 8 degrees in Cut Bank, Montana, right now. Feels and looks like deep winter up here. Thinking that someone will drop below zero tonight, with somewhat more widespread sub zero temps Sunday night. Wind chills down below -10 predicted tonight and this weekend in Browning, Cut Bank, etc. This is the first interesting time that I can post an ECMWF snow prediction (this is liquid equivalent of snow). Maybe some 3-6" for Monday-Tuesday near here. The 06z-12z GFS has also increased snowfall near me. Colorado State is playing at Wyoming in the *snow* tonight. Things cooled down in Laramie. I was wearing a short-sleeved shirt in the 65 degree weather in Fort Collins earlier. Works out to 66F raw, well above the long-term mean of 62.3F, and I upped the analogs another 0.5F for November in line with the slow warming of November. The analogs weren't really designed for "Fall" so assuming it will correct toward the trend adjusted analog mean of 59F by month end. Accuweather has ~60.7F for the rest of the month, analogs have 57.1F. My analogs had a big snowy Fall & Spring for the NW, with a break in the middle - so enjoy it! The AMO came in warmer than last year in October, not good. But it was colder overall for August-October thanks to the hurricanes. For the corridor from Denver to Cheyenne a colder AMO in Aug-Oct is pretty strongly correlated with cooler winter temperatures. I wanted to show Chinook an experiment I've been working on lately. Is it useful? Basically, trying to predict the Modoki values for winter. Problem is there are three components to the Modoki value. What occurred to me the other night is Nino 1.2 October SSTs (raw) probably predict the Box B which is similar to Nino 1.2 in winter, and Nino 3.4 temps probably predict Box A which is similar to Nino 3.4 in winter (both are larger and somewhat extended to the West v. the US regions). The issue would be Box C. Box C is not really similar to Nino 4, its a lot bigger North-South and narrower East-West. So how to predict it? Then I remembered that for whatever reason annualized sunspots correlate (p=0.037) to Box C. I'm still testing it, but finding similar Nino 1.2, Nino 3.4 October temperatures (w/in 0.2C) and similar sunspots vastly improved the matches. The idea is to produce similar Modoki values to winter. Need to keep testing. Will try re-creations back to 1996 when I get some more time to see if it works. I picked up about 7" overnight up here. Fort Collins got over 4". This is our first snow depth over 1.5" this year. On October 9th, or snow was fighting against the warm ground. This time, our 4" will stay for a couple of days. Nice! We got plenty on 10/9, now today nothing but a little fzdz followed by dry gloomy chill. Light freezing drizzle reported at DIA, and also briefly at KAPA, light snow at Boulder this evening. I didn't realize another group of precip would develop. The patterns for October and what we've seen so far for November are broadly representative of what we get in winter I think - cold centered over NV alternating with cold centered over Montana. SE is warm either way, but elsewhere it will alternate from "near normal" to "super torch" the further away you get from the two centers of cold. The good news is in La Nina years the cold is most likely, although it is no guarantee - to shift southeast from where it was in October during the following winter, and it was much further inland into the West this October than last year. November also currently looks like an excellent match to actual SSTs in Nino 1.2 (in October). Wow great find! Monday was a rare sunny day in Glacier Park. Here is a look at October 2017 v. October 2016. Just a wee bit colder in the West? Yes, it was a huge difference of +6.0F last year vs -0.6F this year. We have kept some of our snow cover today, as the temp was about 40. Yesterday morning was very foggy here until maybe 9:00AM. My winter analogs had one off, fairly cold November pattern in the East, with no "repeat" through April - its supposed to get pretty cold out there, will be interesting to see if the cold moves East/expands. I'm interested in seeing if the winter analogs work well for November. For NM, June is a good indicator of November (temps/precip) and then July works well for December, with August good for January-April cold snaps/snow. June 2017 had the relatively cool East / hot West pattern the analogs have for November. June was stupid/dry hot both this year and last year, so not surprised to see November torching both times. Usually when we have renegade days with highs in the mid 70s or lower in August we get some unbelievable cold shots in Jan-Apr. October, when combined with August, is a very strong indicator for March, and October, when combined with July, is also a strong indicator for December. The cold shots in August 2016 preceded four major cold snaps here: Mid-January, late-February, early-April, late-April (including accumulating snow, with the sun up, on April 29th, ~25F below normal highs). August 2014 had a day with a high of 72F...and there was one major cold snap in Feb 22-28 2015 with 10 inches of snow in the city, and several highs 30F below normal. We had a couple highs in the mid 70s in August 2017, so would expect some major cold snaps. August 2015 had no days with highs in the 70s, and we basically couldn't buy any rain or snow from mid-January to mid-April. Terrible - especially since July 2015 was cold/wet and December 2015 had "Goliath". August 2013 didn't have days with highs in the mid 70s or below - and it was pretty warm/dry from January to April. August 2012 had one day in the mid 70s, and we had a couple crazy cold shots in January-February 2013. August 2011 was stupid hot, and it was very warm January-April, although December was very cold despite a hot July. July Hot in 2016, Mild in 2017 --> December Warm in 2016, Mild in 2017? August Cold in 2016, Mild in 2017 --> Four incredible cold shots in Jan-Apr 2017, maybe only two in 2017? October Very Hot in 2016, Mild in 2017 --> March near record warmth 2017, cooler but still warm 2017? Yeah. weird. I'm not even particularly a CSU fan and I don't like it at all- really generic. While things are boring around here, I will post an old picture from 2012. This is the Medicine Bow Range in the distance, as seen from Crown Point. 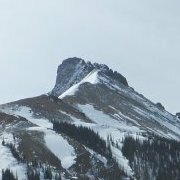 Crown Point is an 11463 ft rocky outcropping in the Comanche Peaks wilderness, but it doesn't look like much. You can't really see it from any particular city or town. The Medicine Bow Range is at the edge of Larimer County, north of the pass. So you might consider the Medicine Bow Range as the Front Range. I think I see a little bit of the effects of moving clouds, messing with my panorama computer program.